I don't recall if I have mentioned this before, but Donna Tartt's second novel The Little Friend was possibly one of the more disappointing novels I have ever read. Exciting and well written, it is let down by it's strange manipulation of genre; a murder mystery in which the murder is, frustratingly, never solved. No wonder, then, that I approached this novel, Tartt's third offering in something like 20 years, with trepidation. I had heard from several people whom I respect greatly that this was an unputdownable novel, exciting, clever and what have you. The proof copy was no easy acquisition. And finally, last Friday when I began to read, I was put under it's spell for myself. The story begins when Theo Decker is thirteen. Having fallen in with a bad crowd, he's managed to get himself suspended and he and his lovely, idyllic mother are on their way to a meeting with the principal when they happen to stop at the art gallery to see the Goldfinch, one of his mother's favourite paintings. By all rights, they never should have been there, but they are, and when a bomb goes off in the gift shop... Theo's mother is killed. Theo, miraculously, survives, and at the urging of a charismatic dying man, he takes the painting, and some instructions to find Hobart and Blackwell. And after this, his life will never be the same. Tartt doesn't mince words in the same way that Tim Winton is known for not mincing words. Her images are sharp and to the point. Flowery language has no place in this 770 page epic. The story reads something like a cross between Catcher in the Rye and television's White Collar. It is exciting, angsty, and authentic, with characters who will stay with me, I am sure, for a long time. 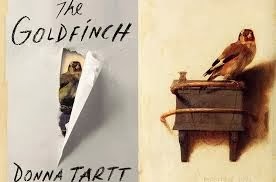 Unlike with The Little Friend, I am left satisfied, and eager to read more of Tartt's work, when and if she chooses to publish.